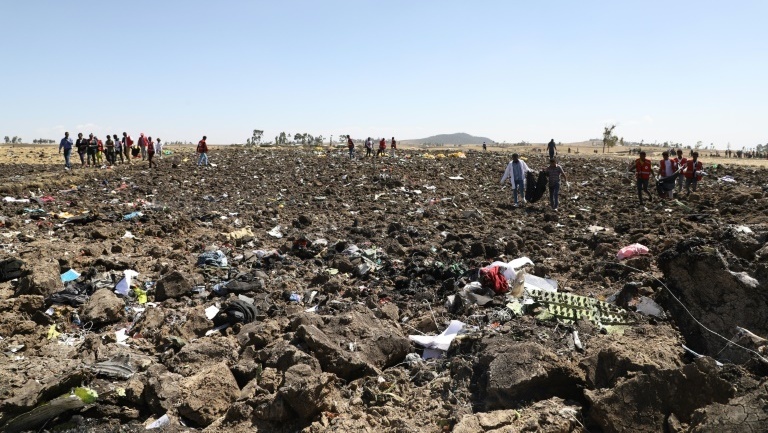 ADDIS ABABA: Investigators probing the deadly crash of an Ethiopian Airlines Boeing 737 that plunged into a field in a ball of flames were to comb the wreckage on Monday (Mar 11) for clues to the cause of the disaster, as operators around the world began grounding their fleets. The brand new MAX 8 plane – one of Boeing’s flagship aircraft – came down on Sunday just six minutes into its flight to Nairobi, killing all 157 people on board. The airline today said it was pulling its stable of 737 Max from service, hours after China’s air safety regulator ordered domestic airlines to do the same. “The plane was already on fire when it crashed to the ground. 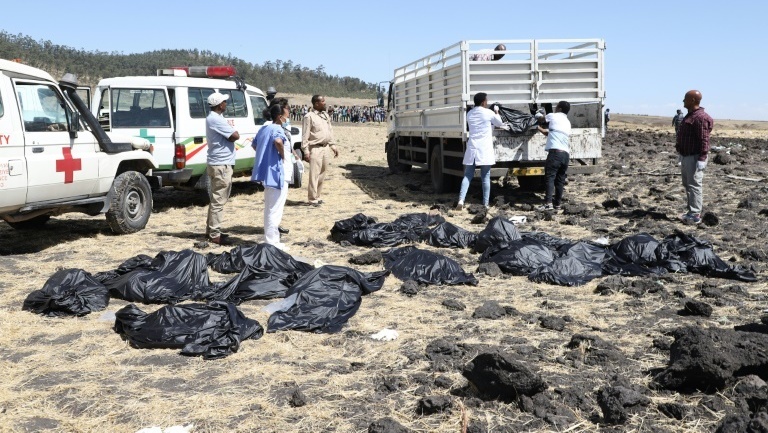 The crash caused a big explosion,” said witness Tegegn Dechasa at the site, littered with passenger belongings, human remains, and airplane parts. Ethiopian Airlines said the pilot had been given clearance to turn around after flagging difficulties to airport authorities. Among the dead were tourists, business travellers, and UN staff, including some who worked for the World Food Programme, the UN refugee agency (UNHCR) and the International Organisation for Migration. The IOM said early indications were that 19 staff members of UN-affiliated organisations perished in the crash. Many were headed for an annual assembly of the UN Environment Programme, which opens in Nairobi today with 4,700 heads of state, ministers, business leaders, senior UN officials and civil society representatives. Ethiopian Airlines, Africa’s biggest carrier, said the search of the crash site had been suspended overnight but would resume in daylight. “Once the... deceased are identified, their bodies will be delivered to their families and loved ones.” The US National Transportation Safety Board said it would send investigators to assist, and Canada, which lost 18 citizens, said consular officials were “immediately deployed” to Addis Ababa to determine the facts. “Deeply saddened by the news this morning of the plane crash in Ethiopia, claiming the lives of all on board,” tweeted UN Secretary-General Antonio Guterres. “It is with deep sorrow that I announce that my dear wife, Blanka, son Martin and daughter Michala, died in the air disaster in Addis Ababa this morning,” he wrote on Facebook. The Boeing 737-800MAX was new, delivered to state-owned Ethiopian Airways on November 15, the carrier said. Ethiopian Airlines said the plane had taken off at 8:38 am (12:38pm Bangkok time) Sunday from Bole International Airport and “lost contact” six minutes later. 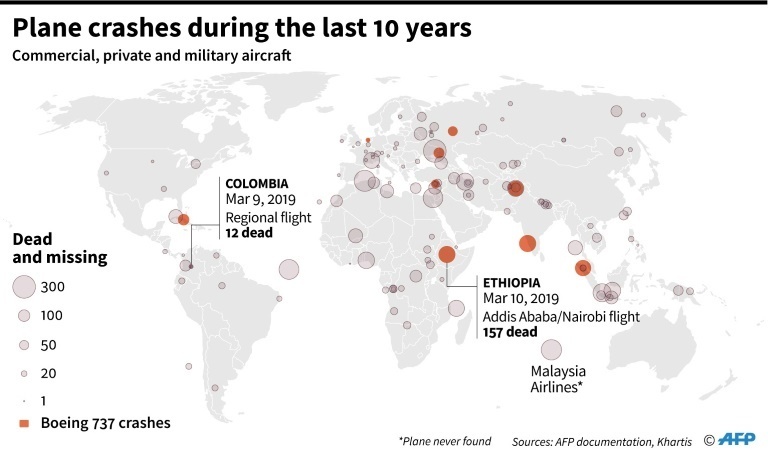 According to the airline, Kenya had the largest number of casualties with 32, followed by Canada with 18, Ethiopia nine, then Italy, China, and the United States with eight each. Britain and France each had seven people on board, Egypt six, and Germany five – though the breakdown was not final. France’s government later said there were eight French victims. Canadian Prime Minister Justin Trudeau and his British counterpart Theresa May both described the news as “devastating”. Sympathy messages also came from the governments of Ethiopia, Kenya, Uganda, Germany, France and the United States. Ethiopian Airlines CEO Tewolde GebreMariam said the plane had flown in from Johannesburg earlier Sunday, spent three hours in Addis and was “despatched with no remark”, meaning no problems were flagged.